BlogAcousticsTake The Poll. What is the Biggest Challenge Facing LEED? Let’s face it, the LEED Green Building Rating System™ is facing some big challenges. The much heralded LEED for Healthcare program was supposed to be released in early 2009, but it is still sitting on the shelf unreleased. The LEED for Schools program has not been met with wide acceptance (since its release in 2007, only 26 schools have been certified under the program, as of this blog posting. See for yourself). And across the industry we are hearing of people who want to build projects to LEED specs, but without LEED certification. Whether or not that’s a good thing, is a topic of controversy. But, for the sake of this poll, we will assume that the readers want LEED to succeed, and that they value LEED as a tool – a standardized methodology for designing green, sustainable buildings. So… take the poll! This poll has been removed. Granted, this poll simplifies a complex topic, so we invite you to join the conversation and submit your comments and thoughts below. Acoustics By Design recently performed acoustical measurements for a LEED for Schools registered project, so that’s what got us talking on the subject. As of this blog posting, there are 179 LEED certified projects in Michigan across the different LEED programs, yet only 1 of those projects is certified under the LEED for Schools program. 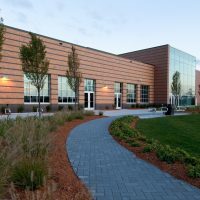 Thus, even if the school we were measuring goes on to achieve LEED for Schools certification, it will only be the second project in Michigan to do so. Ain’t that a kick in the head? LEED also doesn’t give enough credit for historic preservation – not enough consideration given to the embodied energy in buildings that already exist and the energy effiencies that were built into older structures. I also think they need to stop certifiying projects built on greenfields in the middle of nowhere when the only way to reach them is via automobile. That’s just not sustainable.